We take price in our product and we proudly promote it with table tents, flyers, posters, and more sent directly to restaurants and with the option to purchase just a few cases directly from us or in bulk from your local distributor restaurants large and small can find success with our breads. What sells our products are the pictures. 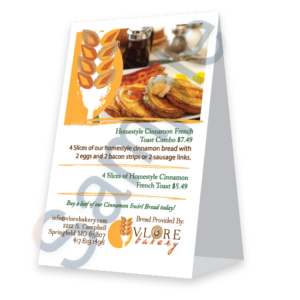 Take support to the next level by adding by adding this product inside your menu with menus made just for you at no cost. Our Place Restaurants in Mansfield and Burleson, TX sell an average of 540 servings of Cinnamon Swirl bread each week between their two locations. 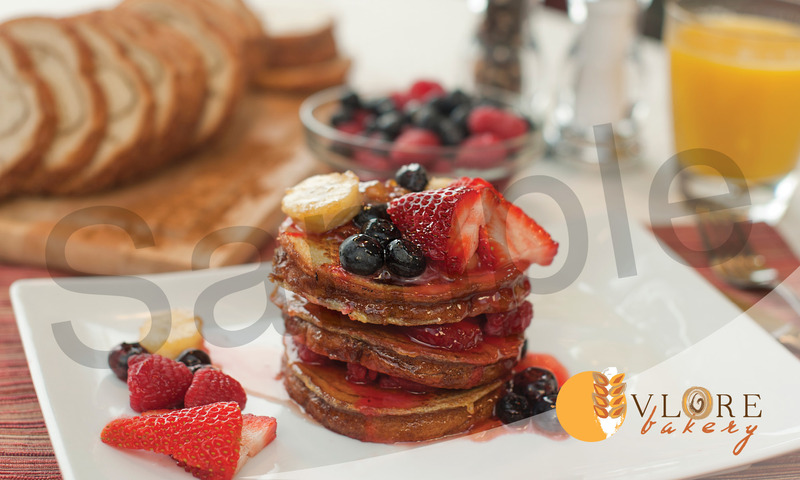 They have created their own signature menu item, the “Stuffed Cinnamon Roll French Toast” which finds cream cheese layered between each slice of French toast and topped with bananas, strawberries, blueberries, caramel sauce and powdered sugar. 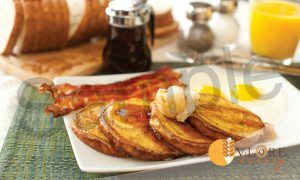 Eggman’s Restaurant in Alsip, IL sells over 520 orders per month of French toast made with Vlore Bakery’s Cinnamon Swirl Bread. Located in the Chicago suburbs, they have been serving the product since 2013. Gus’s Diner in Sun Prairie and Verona, WI sells over 470 orders per week between its two locations. At the Verona location, the cinnamon swirl French toast is the second-highest selling breakfast item. Brothers Family Restaurant in Rapids City, IL sells over 220 orders per week and, during the holidays, sells on average 50 servings of Pumpkin Cinnamon French toast. It also sells loaves of the bread as an over-the-counter offering. They have been a Vlore Bakery customer since 2012. Esmeralda’s Pancake House in Monticello, IN is a new addition to the Vlore Bakery customer family. In its first week, they sold over 200 orders of Cinnamon Swirl bread. Serving nearly 3,000 eateries in the midwest and always expanding. Join us today by purchasing online or from one of our distributors including Reinhardt, Sysco, Performance Food Group, US Foods and more!